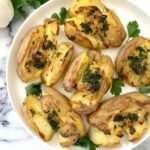 Garlic Smashed Potatoes with parsley and butter, an incredibly delicious side dish that makes a great alternative to the good old roast potatoes. Crispy, heavenly flavourful, and sinfully golden, these smashed potatoes are my new favourite side dish. 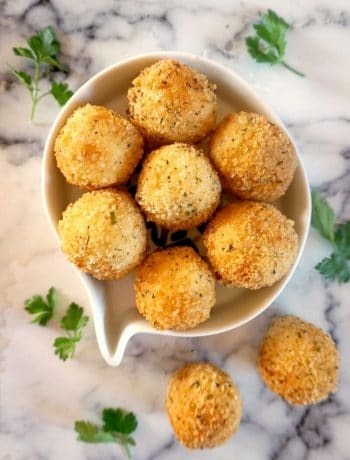 The term smashed potatoes might seem a bit odd when you first hear about it, but actually these smashed potatoes are so delicious, you will find your self making them over and over again. 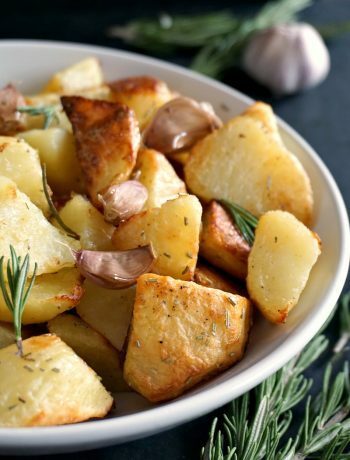 It might take about the same time as the regular roast potatoes, but somehow, it seems quicker, perhaps because they only need about 20 minutes or so in the oven, since they are boiled beforehand. As much as I love the good old roast potatoes , if you cut them in bigger chunks, you keep checking the oven, hoping they are finally done. At least, that’s what I do. I become pretty impatient when it comes to a good Sunday roast, probably my favourite food ever. Baby potatoes work better for this recipe, not only they boil quickly, but once they are smashed, they become a decent size anyway. Now, imagine a medium-sized potato, how odd would that look smashed! I prefer to keep the skin on, it crisps up beautifully in the oven, but I guess you can also take it off, but now I’m unsure if they stay in one piece when you smash them. If you use a fork for that, I would be careful not to break them completely, perhaps a potato masher works better to just press on the potato to smash them well. 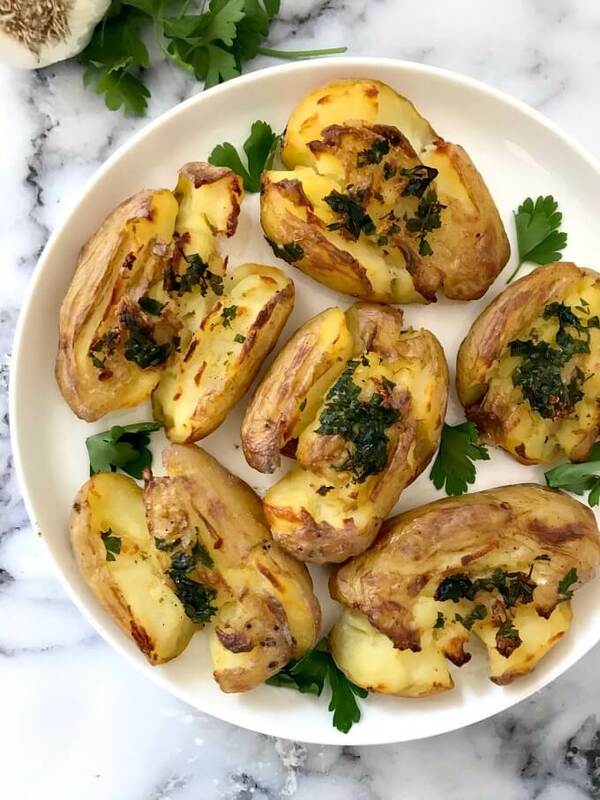 Now, the combination of butter, garlic and parsley is a killer one, you get the most amazing combo of flavours, which works so well with the potatoes, it’s almost impossible not to like it. I used oil as well, but I decided I liked butter better, not only it gives more richness, but helps the potatoes crisp up better. If you like dill, go for it as well, it’s a different flavour, but a delicious one anyway. Dill and potatoes are the star of my Deviled Egg Potato Salad with Salmon, and I absolutely love the combination. 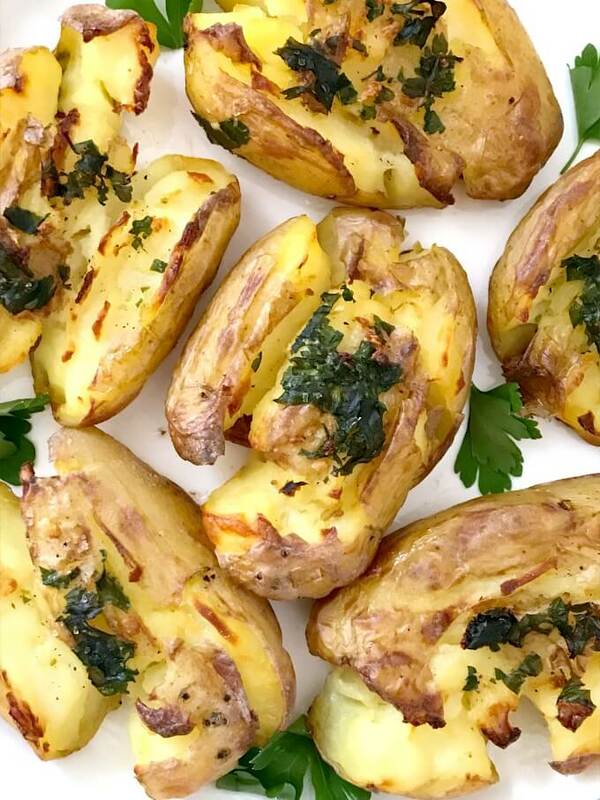 So, wheter you serve these garlic smashed potatoes with your usual roast, BBQ or some sizzzling sausages, you know you are in for a treat. A super delicious one for sure. 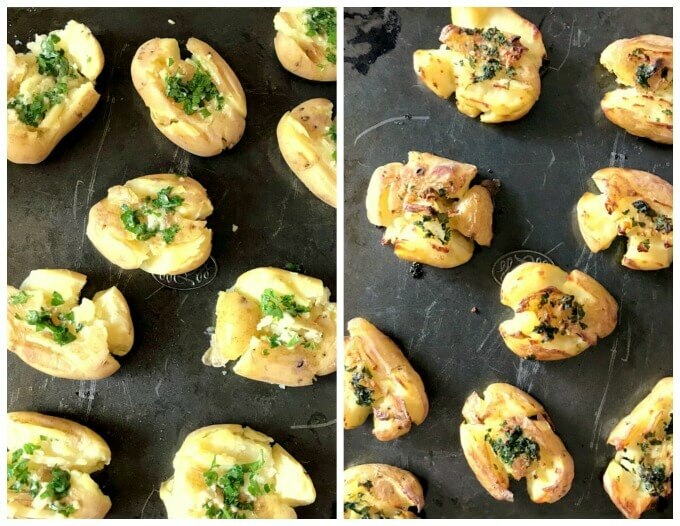 If you’ve tried my GARLIC SMASHED POTATOES or any other recipe on the blog then don’t forget to rate the recipe and let me know how you got on in the comments below, I love hearing from you! You can also FOLLOW ME on FACEBOOK, and PINTEREST to see more delicious food and what I’m getting up to. Boil the potatoes in their skin until cooked through. Pre-heat the oven at 200 degrees Celsius (400 Fahrenheit). Use a fork or a potato masher to press on the potatoes and smash them, still keeping them in one piece, but trying to flatten them up as much as you can. Mix the melted butter with the minced garlic and parsley, and drizzle a bit over each of the smashed potatoes, then season with salt and pepper to your taste. 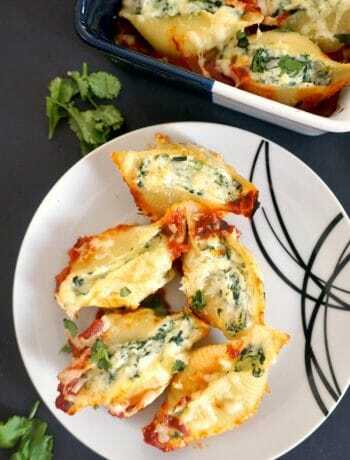 Bake in the oven for about 15-20 minutes until the edges are begining to brown and they potatoes are crispy.